I remember growing up and thinking my mom had everything but the kitchen sink in her purse and never understood why. As I get older with more life experience under my belt, I have finally started to understand! I think it’s a natural thing to want to carry as many things as possible just in case, especially when you have kids. 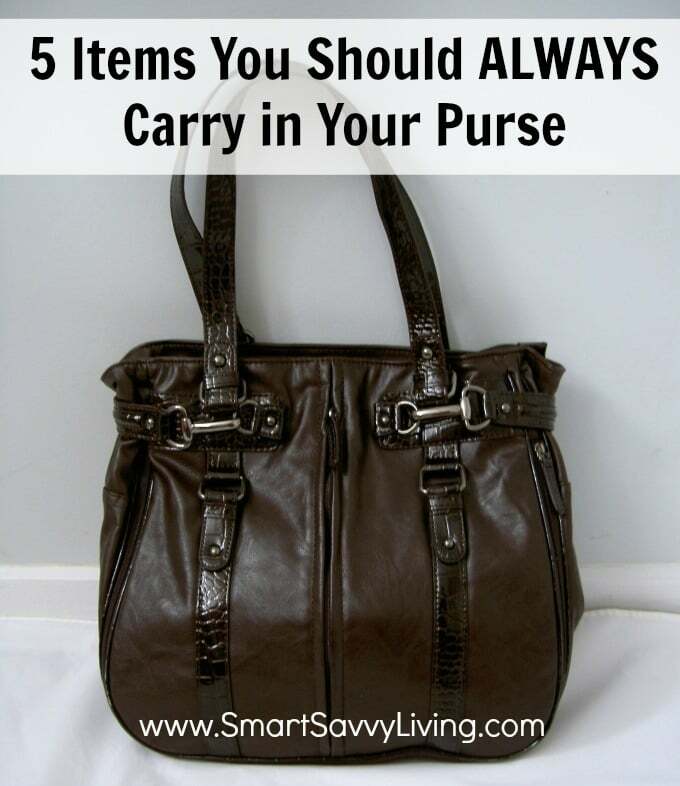 But, no matter your age and size of your family, here are 5 things you should ALWAYS carry in your purse. 1. Health Emergency Items – Always be sure to have your health insurance card with ID, a list of medications you’re on along with a list of any allergies and a few emergency contacts. You never know when you may be involved in a wreck or have some other medical emergency and having this information available will help you get the best care possible. If you have pills that are vital to your health, you may even want to keep a day or 2 dose in your purse as well. 2. Emergency Cash – Mr. Savvy and I were once stranded with a broken down car while traveling back home, so I know first hand how important it is to have some emergency cash on hand. Have some dollar bills and quarters in case you need to use things like vending machines and pay phones. I also like to have a credit card, even if I don’t normally use it, just in case we need an unexpected stay at a hotel or need to rent a car. 3. Phone Charger – These days our lives seem to almost revolve around our smartphones with social media. But, they can be important in emergencies, too. Not only can your phone be a communication device, but it can also be used as a flashlight, for note taking and taking photos and video if you get into a wreck, accessing maps and local road conditions, etc. However, that charge won’t last forever, so make sure you have a phone charger, with car adapter if your vehicle doesn’t have USB ports. 4. Flashlight – It never fails that breakdowns seem to happen at the worst times, like at night. That’s why I like having a physical flashlight in case the phones happen to be dead and the car lights aren’t working or if you need to walk to shelter. A flashlight will not only help you to see, but help others see you as well. Flashlights with strobe features can also help you stay protected (strobe lights tend to disorient those not expecting it) and also help people locate you. While I go back and forth between pads and tampons, I prefer to carry pads in my purse as they are easier to use on the go and take up less room in my purse. 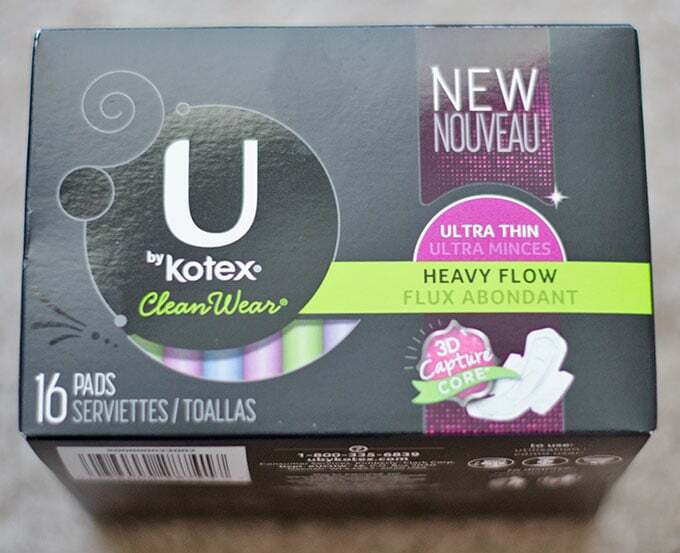 My go-to has recently become U by Kotex® pads because they are super thin but have amazing absorption thanks to the 3D Capture Core. I love how they are so thin and soft that it makes this quick emergency leak and worry-free. After all, I think most of us could use less things to worry about! Plus, I love that the designs on the packaging are super cute and not something you feel like you have to bury at the bottom of your purse so no one has a chance of seeing them. 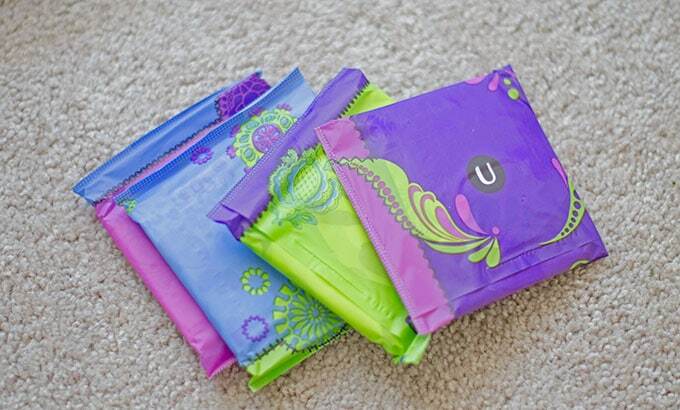 The best part is that you can request some free U by Kotex® samples to try for yourself, just click on the link! Be honest, do you have these 5 Items You Should ALWAYS Carry in Your Purse? A few years back I read Emilie Barnes’ book “More Hours In My Day”. She did a chapter on purse organizing where she talked about using cute little zipper make-up bags to hold certain items in each one. I have one bag that holds my cell phone charger wire, a charging cable and a plug-in charger, one bag that has a few Softcups, band-aids, neo-to-go, Motrin, Carmex, hand lotion, nail clippers and a file. I also have a mini sewing kit and wallet. They all fit into a gallon sized freezer Ziploc bag that I just put in my tote before I go out. During cold and flu season I’ll add some cough drops to the bag.